Task chairs are heavy duty office chairs designed to keep you comfortable for hours. Buying one may seem like a simple purchase, but everyone has a unique body and shape. Most chairs nowadays have all the ergonomic function in a chair like the backrest, armrest, chair base, adjustable heights and materials used. The one thing that separates Trendsetter Task Chair from Laura Davidson is its unique modern design that lets you jump to the future. It has a very futuristic design and is available in 5 different colors ( Blue, Red, Silver, Black/Black and Black/White) which can complement your interior design. This chair will not only please your body but your eyes as well. This chair will make a dramatic statement in your home or office at an affordable price. We hope after reading this review, you will make the correct choice if trendsetter is the best fit for you. Trendsetter Task Chair has a futuristic design that will surely make a nice trendy statement piece in your modern home or office. This chair has a product dimension of 18 inch width by 19 inch depth and 21 inch height with a shipping weight of 25oz. The pneumatic gas seat height adjustment is very convenient as it can adjust to a very high height. The base frame is made of 5 star steel base which makes it very durable and sturdy. It has 5 dual wheeled casters that slides well with most types of floors. Whether your office or home office has a wooden or carpeted floor, it will roll away smoothly and they won’t easily break away. This chair also has a tilt lock feature that makes it customizable for your preference. The seat cushion is not too firm and not too soft and is very thickly padded for comfort. Breathable mesh back prevents perspiration and provides comfort to your back as it molds to your back and ensures proper posture. The chair also reclines comfortably and swivels smoothly. The Arm rests aren’t full length like other comfy office chairs but they still function nicely. Assembly is very easy but another pair of hand will make aligning the screws less difficult. Estimated time of assembly will be around 10 to 12 minutes. The package includes a few parts that will need to be assembled. There is a total of 8 different sections that will need to be assembled together. Package also includes all the needed hardware and wrench to assemble it. In conclusion, if you chair is still from the 90’s and you want to jump to the future, The Trendsetter Task Chair is the correct way to go. With all the colors to choose from you will definitely not get bored by the designs and not only will it add futuristic design and ergonomic comfort but also will work around your budget. Satisfied customers rated it as 4.5 stars out of 5 stars. This chair is worth every penny you pay for. A task chair is usually used in office desks. These type of chairs are designed for frequent but short periods of use only. Task chair’s design are also kept basic and simple and created specifically to be used by many different users. Height adjustment is one of its basic features. To make it possible for user to roll easily from on place to the other while performing various tasks, these chairs includes four casters at the bottom. Another basic feature is the 360 swivel which makes it easy for you to go back and forth between tasks. Because of its basic design, most task chairs are inexpensive to manufacture and produce quickly. 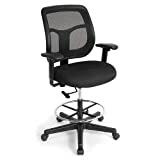 One of the most popular in the market is the Boss Mesh Back Task Chair manufactured by Boss Office Product which is a company based in Los Angeles. Please read on as we review all its features. 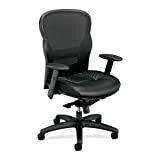 The Boss Mesh Back task chair has a product dimension of 25 x 23.2 x 42 inches and weighs around 27.2 pounds. This task chair has a pneumatic gas lift seat height adjustment for various users. Another customizable feature is the adjustable tilt tension control so that you can find the best angle you are most comfortable with. Material used for this chair is very unique as it uses black leather plus with cushion for the seat while using breathable mesh for the back. The black leather plus seat is very beautifully upholstered to maintain durability to last a long time. It also adds a professional touch to the chair and makes it look pretty expensive, even though it really is not. Leather seat also makes it very easy to maintain as it does not stain as much as cloth. The breathable mesh is very easy on the back as it not only ensures good support but also assures you cool temperature and less sweat than when using leather back. The loop arms are not adjustable and is made up of Pewter finished. The base is also made of metal Pewter which is very simple and gives a very light gray patina color. American Pewter Guild recommends a multi metal polished used to clean silver to keep a shiny mirror like finish to your Pewter arms and base. It also has 5 dual wheel and hooded casters for easy mobility. Assembly is very easy and straight forward as all the necessary things you will be needing is already included in the package. The chair is plainly labeled underneath to prevent you from attaching the seat backwards. Screws are also pre drilled underneath the seat of the chair. The chair looks very sturdy and made of quality material. The Boss Mesh back task chair is really worth the money you spend. With its low price in Amazon with free shipping it is really affordable and durable. 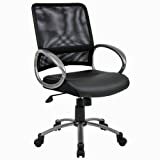 It is also ranked 4 star in Amazon and is ranked #10 is task chairs under office products. Sled style base chair is flat across the floor and offer a complete way to balance any weight that is put in the chair. This type of chair also helps you from worrying that chair is rocking from side to side. Reception chair or office side chair for guests is one of the most important furniture in an office, since it is usually the first thing a client or guests see when entering your office. This chairs also serve as customer’s introduction to your business as the saying goes “first impression lasts”. You would want your reception area to reflect a good positive vibe not only to the guests but for your work force as well. The whole primary purpose of this chairs is to make customers feel comfortable and at ease because sometimes customers have to wait for several hours. It is also important to create a friendly, warm and welcoming ambience. Make sure you do research about the reception chairs so that it can accommodate people of all heights, sizes and weights. Design and color is also very important as it will add to the positive impression you are trying to make. This chair we are reviewing is available in the market with all those features and more, hope this will help in your decision which chair to get for your office. Flash Furniture Black leather, mesh back and sled base chair is a great side chair for the reception area with its breathable black mesh back that will keep you cool and comfortable even for sitting a long period of time. This chair has a 22-3/4 inch width by 24 inch depth by 34-3/4 inch height as its product dimensions. Even for big guys weighing around 210 pounds and 6 foot tall in height will not have any problem sitting this comfortably, and this sled base chair can fully support you. Its black leather seat adds the classy professional look this office chair needs. The seat is also thickly padded for maximum comfort. Additional feature that gives comfort is the ergonomically contoured lumbar support for your lower back. This allows you to sit comfortable without straining your back since its contoured lumbar support fits perfectly for our back because it follows the curve of our spine. The chrome frame finish provides a sleek and modern look to coordinate with your environment’s design. The base is sled so its not as mobile as those chairs with base casters. But they are more sturdy and stands firm because its made of metal and don’t easily rocks from side to side. Assembly is a little difficult as the instructions are about as vague as it gets and some of the holes don’t line up that well. Having another hand will be a great help when assembling this thing. And as a suggestion, don’t tighten all bolts yet until you have lined up everything. In conclusion this chair is pretty efficient and effective with its features and did I mention the price is very affordable? It is available in Amazon with free shipping. This chair has a 4 stars rating with almost 60 reviews. Task chairs are heavy duty chairs that are designed to keep you comfortable for hours. Buying one may seem like a simple purchase but every person has a unique body shape which results to some not fitting each person. Some factors are the backrest, seat, armrests height and chair base. Most task chair have no armrest which makes it easier to pull in closely to your desk. Mesh type chairs are attractive compared to leather as these types of chairs are cost saving and usually averages under $100. Another great advantage of mesh chair is the ventilation they can provide because of its design, it allows air to flow naturally through the back of the chair as oppose to leather which have a tendency to get warm on hot days. Another advantage is the modern sleek design mesh chairs have. The task chair we are reviewing is one of the simplest and most affordable in the market. We hope this review can help you with the decision you are facing. 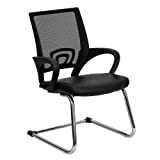 This Mesh task chair is made by office star and has a product dimension of 22.5 x 18 x 39.2 inches. It is a simple mid back task chair that has a one touch pneumatic seat height adjustment to accommodate person with different sizes and adjust the height of the chair according to the person’s or table’s height. This way, you won’t be slouch over your desk and hurt your back or be in an awkward position with the table taller than you. The back of the chair is made up of mesh which makes it breathable and comfortable. Seat is cushioned to provide maximum support. The 360 degree swivel makes it very easy to jump from one task to another. This chair is also very durable because its mostly made up of metal and heavy duty nylon base with dual wheel carpet casters. The dual wheel carpet casters are great to use on any flooring, and make it easy to slide even if it is on a carpeted floor. This chair comes in 3 different colors (green, orange and pink) so you have the color options to choose from that will depend and fit well with the interior design of your home or office. Another good feature is the size because it is very compacted and would fit in a small areas. This chair is pretty easy to assemble, you can find all the tools and instructions included in the shipping. After assembling this durable task chair no need to wait for anything and just sit comfortably in your new chair which will last for a long period of time. This chair is a good value for the price. It is available in Amazon with free shipping. Rated 4 star with 50 reviews from valued customers. So if you are looking for a good value and simple mesh task chair, then this is the right one for you. It does its purpose and still make you feel comfortable even while you sit for long hours. If you look at any office scene in a movie or TV show or even a high powered executive being interviewed sitting at their office chair a high proportion of these chairs are undoubtedly upholstered in leather. Good quality leather doesn’t come cheap that is why there are cheaper substitute like polyurethane leather. This type of leather looks and feel as a genuine leather but is less durable and may not last as long as genuine leather. An advantage of these type of leather is, it is waterproof and easily cleaned and maintained. For persons that are on a tight budget this is the way to go, its price is usually half the cost of real leather. Aside from being made of leather, executive chairs looks better and is more comfortable if they are high back. High back chairs usually have the full support from head to the lower back. This type of chairs looks very stylish and professional making it a great addition to any business office. The design also gives a credible boost to employess and clients. If you hang around, we will review one of the most affordable high back executive leather chair in the market today. New High Back Executive Leather Ergonomic Office Chair w/Metal Base O15 is one of the newest model best chair has to offer in their line of high back executive chairs. This chair has an adjustable height which is the lever at the bottom of the seat, and adjusts from 19” to 23” so its really made for taller or bigger people. Its weight limit can accommodate upto 250lbs so it is very sturdy. The chair is made up of soft PU (polyurethane) leahter upholstery that is oil and water resistant. This type of leather is easy to clean and maintain and also gives the leather a uniform shine and a long lasting “new” appearance. This chair has an ample padding from seat cushion to lumbar support to shoulder rest upto head rest which makes it comfortable even when sitting on it for a long time. The back cushion reclines but is also very firm which ensures your good posture at all times. The armest is not adjustable but is positioned at the right angle that it gives full support and comfort. The base is made up of heavy duty steel with 5 dual wheeled casters that can move easily from carpeted floor. The O15 comes in 2 different color black or brown, my personal opinion is you can never go wrong with black, but there are others who find it very traditional and boring so the brown color gives it more variety. Assembly is very easy, just follow the instructions. The instructions are pretty clear and straightforward. Estimated time is about 15 minutes. If you are looking to design your office environment with class that is within budget, then you have found your chair. 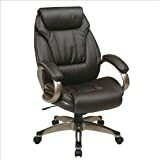 The New High Back Executive Leather Ergonomic Office Chair w/Metal Base O15 is available in Amazon with free shipping. It has over 400 customer reviews in amazon so if you are still not convince by this review, you can also check that out. Most high back leather chairs are used for “executives” as they look more professionally and are more generously sized than most task chairs in the market. Here are some of the benefits of high back chairs. First is the head support; this allows you to loosen up and rest your head from time to time. Second is the neck and shoulder support, this features allow you to relax a bit and take pressure of your neck and shoulder from sitting down for a long time. Third is the overall support, which assures you that whatever you are doing you will be at proper posture at all times. Lastly is the sophisticated style that makes this chair looks professional, making it a fine addition to any business environment. Design makes you look credible which can boost the confidence of your employees. Prices of these types of chairs are actually quite reasonable, finding the correct chair will prove to be a long-term investment. This chair we are reviewing has a potential to be that investment. The Black High Back PU Leather Executive Office Desk Task Computer Chair w/ Metal base 018 is high back chair that is comfortable and has soft PU leather upholstery with ample padding. PU leather stands for polyurethane, which is also called bicast leather. The main benefit of using this leather is its cheaper than actual leather but has the same look as the genuine leather. Polyurethane gives the leather a uniform shine and a long lasting “like new” appearance. This type of leather is also very easy to maintain and clean. This chair is also oil and water resistant so it is very durable and long lasting. It has an adjustable height from 19” to 23” for taller and bigger people. The height adjustment lever is found underneath the chair and is very easy to reach. The chair has enough padding from the seat cushion to the back and headrest. The back cushion is very firm which ensures good posture and provides maximum support. Armrest are padded and aren’t adjustable but are positioned at the right angle where you won’t feel any discomfort. This chair has a metal base consists of 5 dual wheeled casters that can support up to a weight limit of 250lbs. The dual wheeled casters as well as the 360 degree swivel makes it very easy to move from one place to another, this feature will add to your employees productivity especially if they are multitasking. Assembling this chair is a tad difficult, as you will need another pair of hand to make it easier. Aside from a little difficulty with the assembly, this chair is a steal, with its price of less than a hundred bucks; you will have a hard time finding a sturdy and comfortable leather chair that is as affordable as this. It is available in Amazon with a 3.5 star rating with over 395 reviews, so if you aren’t convince yet with our review you can visit amazon to see customer’s reviews. Did I mention this chair is also available in all white? Choosing the color would just depend on the design of your interior. Looking for a great drafting chair? Or maybe something to replace your beloved drafting stool of 5 years in your home office? Or maybe something for you and your employees in the new office? Then this Eurotech Apollo mesh back drafting stool might just be the one you are looking for. In terms of looking for a great drafting stool you should really consider the seat height and the adjustability of the chair, as these are the most important things. Although most people who use a drafting table don’t really lean on the back for support this model comes with a mesh back in case you feel tired from all the drafting, sketching, drawing, and whatever else you will do. And because it’s mesh, its breathable and comfortable with just the right amount of style thrown in. The Eurotech Apollo mesh back drafting stool features adjustable back height, adjustable pneumatic seat height, and adjustable arm height and width. Like I said, drafting stools are meant to be high enough for you to be able to properly use it for a drafting table. This chair seats high and even has the ability to adjust to your preference. The build quality of the chair is undoubtedly very good – well-built and great use of materials. This is one drafting stool you know will last you for years to come. Props to the people of Eurotech for creating one heck of a drafting stool for everyday use. The back mesh, although not a requirement for drafting chairs as mentioned, it is still very comfortable; making this chair versatile as you can also use it to relax, play on your computer, or watch TV. The Apollo mesh back stool also features a foot ring for support and comfortability. Though the foot ring is solidly built, some consumers mentioned that it might have been better if it was a bit bigger in diameter so you didn’t need to put your feet in too far just to use it. But I guess that’s a personal preference, it feels just right for me. Another plus of this chair is that it looks very sleek and professional, while a lot of drafting stools in the market actually look and feel “plastic” like. This stool really feels like you paid more than you actually will for it. Really got to give it up for the comfortability of the chair and all the adjustability it comes with. This stool weighs about 50 pounds, which really gives you that sense of quality of the construction and materials. Assembling the stool is fairly easy as everything you would need is in the instruction manual. Though just look carefully on the drawings as there are some washers that are not specifically identified so you’d have to deduce it by process of elimination. It’s not too hard though. An average of maybe 10 – 20 minutes for the assembly time. The Eurotech Apollo mesh back drafting stool has a quite expensive list price but the good news is that you can get it on Amazon by almost half of its price and it comes with free shipping too. So you get to save more than 50% at the comfort of your own home. This stool rated 4.5 out of 5 stars from their customers. If you’re reading this then it means you’re looking for a new task chair or a chair to sit on mainly for computer or desk use. This Boss Leather Plus Posture task chair is a really great task chair that allows you to have a proper posture. Although this chair is not a mesh chair it’s still pretty breathable and comfortable to sit on even after hours of sitting on it. The Boss Leather Plus Posture chair is an armless chair made for support and comfort. Although it doesn’t have an armrest it’s still a great chair and well, if you’re a musical person and like to play your instruments you can use this chair or any chair without arms. I find playing a guitar on this chair is quite comfortable and keeps me in a leaned back position while playing. This model also comes in with an armrest but it costs slightly a bit more. This chair is handsomely upholstered in black LeatherPlus material and it is thickly padded so it’s very nice to sit on. It also features a built in lumbar support, a waterfall seat to reduce stress on the legs and it also has a 5 star nylon base for stability and easy rolling to where you need or want it. It has a couple of adjustable features like the back depth and the seat height of course. I really like the back rest of this chair as it is great for lower back support and it can adjust to fit your back. As always, I recommend going out and testing any chair before you purchase online that way you already know what to expect. If testing it out is not possible then you should really do your research before you purchase. I’m sure once you get to sit on this chair you will agree with me that this chair really does feel good on your back and it keep you on a proper posture while doing your work. It’s definitely not going to be a Herman Miller kind of chair but it’s very comfortable and the quality you get for the price is just astounding. This chair was made to be very sturdy and can last you for years to come. It’s not going to take up much space either which is good for cramped apartments, small offices, and the like. This is a great no nonsense kind of chair. It’s comfortable, it’s mobile, it gives just the right amount of support for your lower back, keeps you in an upright position, and it’s subtle you barely notice it in a room. The chair is great for the taller people as the chair kind of sits high, but it wouldn’t be that big a deal if you were shorter just might not be as comfortable and you might not reach the floor with your feet, which is a deal breaker for some but for others it’s something they can overlook. I for one really enjoy the chair especially for the price you pay for one. One thing to note about this chair is that it does require assembly. Be warned though as some of the customers have had a hard time doing this. You have to remove the 4 screws to assemble and these screws are firmly secured with blue loc-tite. You can use a Ph screwdriver to assemble and should take you about 20 minutes if you do it right. You can get this armless task chair on Amazon for a really bargain compared to its list price. It rated a 4.0 out of 5 stars from its consumers. If you’re interested in this chair but would like an armrest then consider the Boss Leather Plus Posture task chair with adjustable arms also available on Amazon.